The 2009 Walk Against Warming was held in several Australian cities on December 12, 2009. 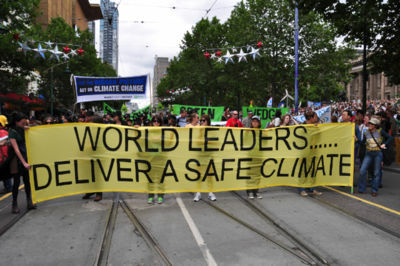 40,000 people attended the rally in Melbourne, Australia. Speakers urged the Australian government to participate in the creation of a binding international agreement to reduce global greenhouse gas emissions and set strong emission reduction targets at the Copenhagen Climate Change conference in progress. 90,000 people across Australia attended the rallies in capital cities and regional centres. Plea from Leah Avene from Tuvalu for global climate action at Melbourne Walk Against Warming 2009. This page was last modified 02:20, 13 March 2011.